Throughout the year dog and cat owners travel the country exhibiting their prize specimens. In both cats and dogs there is camaraderie between breeders, owners and exhibitors and friendships are made for life. For both cats and dogs there are different levels of shows. Cats and dogs never exhibit at the same show they are governed by different bodies, dog being the Kennel Club (KC) and for cats it's the Governing Council of the Cat Fancy (GCCF). For people wanting to show their pets the cats and dogs have to be registered with the appropriate body. General championship dog shows can be on any day of the week with the smaller one-day shows taking place mainly at the weekends. Cat shows are usually one-day events on the Saturday of each week. There are about 1500 cat shows each year but many hundreds more dog shows. For both dogs and cats the size of show can vary from small single breed events up to large championship shows. The ultimate show for dogs is Crufts, which is held in March each year over four days at the National Exhibition Centre in Birmingham. It is the largest dog show in the world and attracts 25,000 entries from around the world. All dogs have to have qualified during the previous year at championship shows. For cats the top show is the Supreme Show that is held for one day in November again at the NEC. Cats also have to have qualified in order to be exhibited at the Supreme Show. When entering either a cat or dog show your first have to obtain a copy of the show schedule and complete an entry form. Schedules are available from the secretary of the organising show and have to be returned by the deadline along with the correct fees for the number of entries made. Winning high honours at cat and dog shows does not make an owner rich, in fact the best in show winner at Crufts never wind more than a few hundred pound for reaching the final stage of competition. Although money can be made from breeding puppies or kittens it is such a costly business to own, maintain and show dogs and cats that it is not an occupation to enter if you want to be rich! 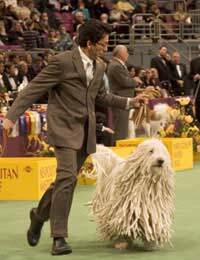 Dogs are trained in ringcraft from an early age as they have to move correctly in the show ring and behave when the judge goes over them to check their conformation. Cats have to learn to accept their small cage from when they are kittens and get used to loud noises that may occur in the show venue. They must also be used to being handled and their mouths being checked. When travelling to a show the animals should be secure in the car. There are cages that can fit into the back of the car or bespoke cages that are designed for the model of vehicle. Some cages can be removed so that they are used elsewhere. The travelling cages have to be immaculate, as the exhibits must arrive at the show in pristine condition.